Periodically applying granite sealer is important for protecting your granite countertops. 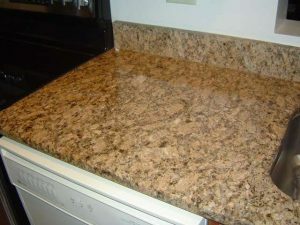 If a granite countertop is left unsealed, water or oil can become absorbed into the granite and form permanent stains. There are two basic types of granite sealers on the market, penetrating sealers and topical sealers. Penetrating granite sealers, also known as impregnable sealers, penetrate deep down into the granite stone, whereas topical granite sealers simply provide a protective coating over the surface of the granite countertop. Typically penetrating granite sealers need to be applied less frequently than topical sealers, due to the fact that topical sealers wear away fairly easy. Also, if applying a penetrating granite sealer keep in mind that they are made from different types of resins. Some resins are better at protecting against water while others do a better job protecting against oil. Make sure to purchase a penetrating granite sealer that protects against both water and oil stains. Topical granite sealers are typically polyurethane or acrylic based. They create a thin film on top of the granite surface and protect against both water and oil spills. There are two main types of topical sealers, strippable and permanent. The strippable type is the preferred topical sealer as it is easily removable from the granite countertop. You should only apply a granite sealer if the granite countertops actually need it. To test if your countertops are in need of sealing, apply a few dime-size dabs of water, oil and lemon juice to the surface of the countertops, preferably in an out of the way location. Let the test dabs sit for a few minutes and then wipe them away. If staining occurred then you need to apply a granite sealer. If you did not observe any staining, apply another set of dabs and let them sit for about 15 to 20 minutes. Again, wipe away the test dabs and see if any staining occurred. If still no staining was observed, then your granite countertops do not require sealing. Sealing granite countertops is easy to do, although make sure to thoroughly read the instructions on the granite sealer before applying it. Also, it is important that the countertops are completely free of dust, dirt, grime and liquids, so make sure to clean and dry them thoroughly before applying the granite sealer. When applying granite sealers it is best to apply two coats. However it is important to wait the granite sealer manufacturer’s recommended time interval in between coats to make sure the sealer binds properly. Apply granite sealer to the countertops using a clean rag or brush. It is best to apply granite sealers in small sections at a time, e.g. 6 to 8 square feet areas. Make sure to not miss near the corners and backsplashes when applying the sealer. After applying the first coat of granite sealer let it set in for a few minutes. Then apply and rub in a little more of the sealer into the countertop using a clean rag. Continue in this manner to seal the entire countertop. Wait a couple of hours and then repeat the process. In addition, if applying a penetrating granite sealer, you may want to follow up later on with a topical granite sealer to protect the countertops surface. For information on installing a shower pan membrane liner for a ceramic tile shower, see the Shower Pan Membrane Liner Installation Ebook from HomeAdditionPlus.com. The Shower Pan Membrane Liner EBook will quickly teach you the step-by-step process for installing the shower pan membrane liner correctly. It includes instructions on framing the shower stall, pouring the pre-slope and shower base mortar, and installing the shower pan membrane liner. See my “How to Tile a Custom Ceramic Tile Shower” Ebook to learn how to tile your own shower: For a detailed set of instructions on tiling a shower floor and walls, including pictures for every step in the process, see my “How to Tile Custom Ceramic Tile Shower Ebook”. 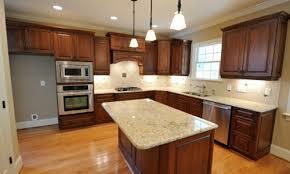 Get Free Kitchen Remodeling Price Quotes with No Obligation! Fill out our 3-5 minute quick and easy form, and receive a free price quote on a kitchen remodeling project from one of our pre-screened and licensed kitchen remodeling contractors. This process is free and there is no obligation to continue once you receive your kitchen remodel price estimate.